Enjoy the beauty of warm summer nights, art, and music with a live set from KCRW DJ Karene Daniel at MCASB. Located on the beautiful Paseo Nuevo Upper Arts Terrace in the heart of Santa Barbara, Curated Cocktails: Summer Nights with KCRW, features unique themes inspired by the current exhibitions Free Play and and Bloom Projects Exchange Series: Silvestre Pestana, Breathless, after-hours museum access, signature cocktails, and interactive art making with Sondra Weiss. 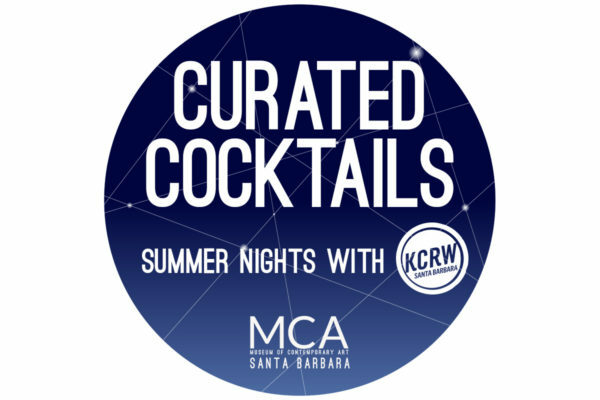 And this month, Curated Cocktails: Summer Nights with KCRW will include special guests desertArtLAB, our most recent resident artists involved with takepart | makeart: arte para todos, and the Santa Barbara Botanic Garden. With cactus-themed cocktails, recipes from the Botanic Garden, and more, July’s festivities promise to deliver. Special thanks to Eureka!, August Ridge Winery, Telegraph Brewing Company, and KCRW.